IF YOU HAD ONLY 30 DAYS LEFT, HOW WILL YOU LIVE? IMAGINE THIS – When you woke up this morning, the phone rings. You’re still in your pajamas, drinking your coffee. You stand up and pick up the phone. I know this is scary. 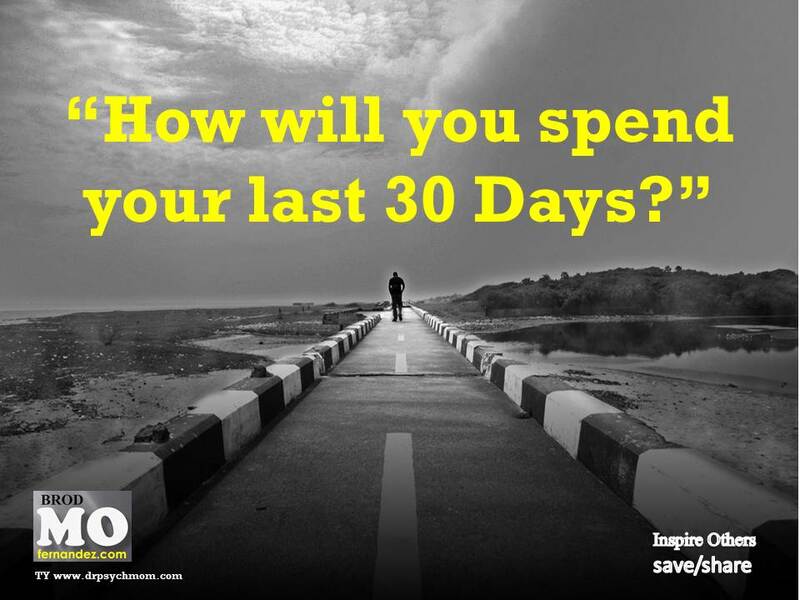 HOW WOULD YOU LIVE YOUR LIFE DURING THOSE 30 DAYS? What appointments will you make? What appointments will you drop? What will you include in your daily schedule? What will you say to your loved ones? What will you not say to your loved ones? How will you pray? What will you pray for? STARTING TODAY, LIVE THE NEXT 30 DAYS AS THOUGH THEY WERE YOUR LAST.